Call tracking software allows you to identify where your phone leads are coming from — whether it’s a print ad, an online ad, or link from another website. We looked at the most popular options and rising stars and decided to review CallRail, CallTrackingMetrics, and Convirza. These companies covered the range of options for small businesses in terms of available features and price. We recommend CallRail as the best call tracking software for small businesses because it’s the easiest to setup, competitively priced, and it gives you highly-detailed call tracking data, including at the website and keyword-level. A market leader in the VoIP world, Nextiva services both offices and call centers, offering a wide array of functionality such as smart call routing. Starting at only $19.95/month, Nextiva offers both inbound and outbound calling, in addition to advanced Interactive Voice Response technology and surveys. Click here to get a free demo. Learn More Online knowledge base, including documentation and API, and ticket-based support. Online knowledge base and phone, email, and ticket-based support from Monday to Thursday 7:30am to 7:30pm EST and Friday 7:30am to 5:30pm EST. Minimal online support and phone and email-based support from Monday to Friday 7:00am to 5:00pm MST. We recommend CallRail as the best overall call tracking software for small businesses because of its easy setup and use, competitive price, and the highly-detailed call tracking data, including at the website and keyword-level, that it delivers. Most call tracking software is very similar — it identifies where each of your callers came from, whether they found you on a billboard, were referred by a website, clicked on a Google ad, etc. CallRail lets you do this for a competitive price once usage is taken into account. Their software is also very easy to setup and use. You don’t need to know any programming or understand any technical jargon. And despite the low price, it also gives you a lot of handy features like an auto-attendant, call routing, and voicemail. 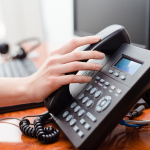 This means that in addition to call tracking, you can use CallRail to setup a professional business phone system. We use CallRail at Fit Small Business and are very satisfied with their easy setup and detailed call reports. If there’s any downside to CallRail, it’s missing some features that can be helpful to larger teams. For example, some other programs we reviewed can transcribe conversations to text, so a manager can more easily overview conversations. This is not a feature of CallRail. CallTrackingMetrics is similar to CallRail, but offers a few more advanced features. For one, you can use CallTrackingMetrics to change the phone number on your website depending on where a visitor is located. This feature, known as geo-routing, is helpful for businesses that market internationally since they can show their visitors a phone number for their home country. 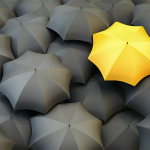 It’s also helpful for larger sales teams who need to segment customers geographically. CallTrackingMetrics also provides an advanced tool that scans phone conversations and converts them to text. If any keywords are stated, such as “setup appointment” or “not happy”, the software can automatically send an alert to a manager. In most cases, Convirza works out to be more expensive than CallRail and CallTrackingMetrics. However, this is because they offer call quality management features in addition to their call tracking. Like CallTrackingMetrics, Convirza can transcribe your phone conversations to text and send an alert when certain keywords are said. Then, they run sophisticated algorithms to score how a salesperson performed, and how likely a caller was to buy. 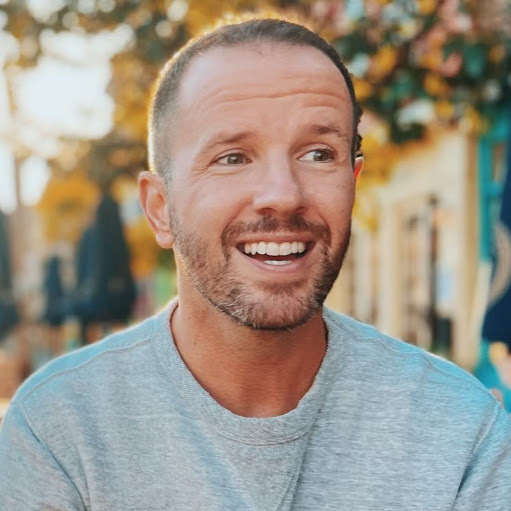 This can be helpful for larger businesses who need better oversight over their salespeople but may be an unnecessary luxury for smaller businesses. CallRail, CallTrackingMetrics, and Convirza all offer a range of monthly plans with different features included. In addition to the cost of the monthly plans, usage is charged extra. CallRail offers two pricing plans that are suitable for small businesses — Starter for $30/month and Pro for $130/month. Most notably, the Starter plan includes 10 local numbers, 500 local minutes, and 100 text messages. The Pro plan includes 20 local numbers, 2,500 local minutes, and 500 text messages as well as lower pricing on additional usage. CallTrackingMetrics offers two pricing plans that are suitable for small businesses — Essentials for $19/month and Advanced for $99/month, both plus usage. The Essentials plan charges $2.50/month per local number, $0.045/local minute, $4.50/month per toll-free number, $0.065/toll-free minute, $0.05/outbound minute, and $0.018/text. The Advanced plan charges $1.50/month per local number, $0.035/local minute, $2.25/month per toll-free number, $0.05/toll-free minute, $0.029/outbound minute, and $0.012/text. Convirza offers two plans — Standard for $29/month and Advanced that’s priced by custom quote. The Standard plan includes ten tracking numbers (local and toll-free) and 600 minutes and the Advanced plan will include numbers and minutes that are commensurate with the quoted price. CallRail is one of the easier call tracking programs to set up. It has a simple wizard that guides you through the process step-by-step. For dynamic tracking, you just need you to choose your phone numbers, then copy and paste the automatically generated code onto your website. As an additional option, CallRail lets you assign number pools to specific sources. For example, you can assign ten phone numbers to Google paid searches, five phone numbers to Bing paid searches, etc. This is helpful if you want to track Google paid keywords, for example, but are less interested in the other sources. 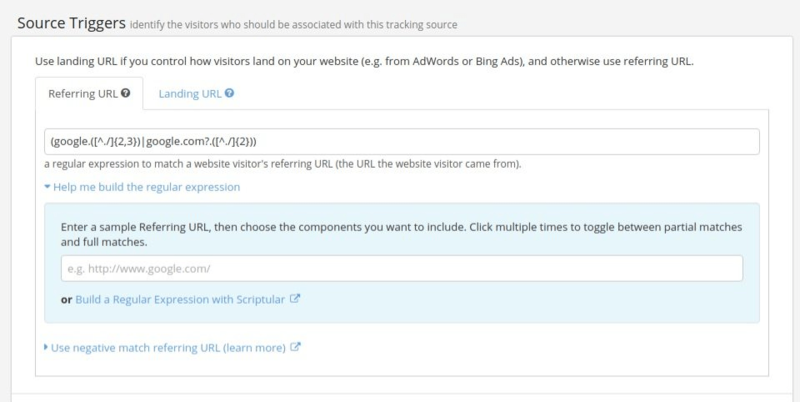 For a simpler approach, CallRail also lets you “track all website visitors” with a single number pool. Once setup, CallRail begins working immediately. From your dashboard, you’ll be able to view the source of calls (“Ref Domain” to the right in the image) along with the date and duration. Under “Source Type” (to the left in the image) CallRail is also able to identify paid vs. organic traffic on Google, Bing, Yahoo, or Facebook. To the far-right, you can also find the keywords that were used to search for your website. You’ll probably notice many of the searches in the image above are “not provided.” This is because CallRail can only track paid searches – that is, it can only find keywords when the visitor clicks on a Google or Bing ad. 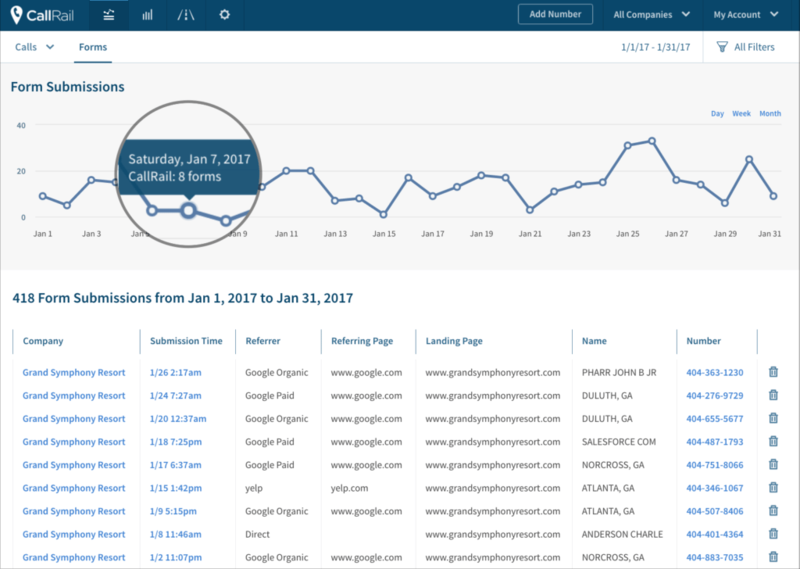 None of the programs we reviewed (nor any we are aware of) can track keywords on organic searches. Setting up CallTrackingMetrics can be a bit more complicated at first. Once you grasp the menu, however, it’s just as simple as CallRail. Also, like CallRail, you can only track keywords on paid searches, not organic searches. You can also assign a separate number pool for each website you want to track. CallTrackingMetrics gives you a little more flexibility than CallRail, since you can enter any website you want (you’re not limited to just Google, Bing, Facebook, etc.) To do this, you’ll need to use the “Source Triggers” menu, which can be rather complicated. Check out this support article for a walkthrough of source triggers. With an advanced account, you can also setup a feature called geo-routing. This allows you to change phone numbers based on a visitor’s location. In other words, a visitor from France can automatically be shown a French phone number; a visitor from Italy an Italian number, etc. In the US, you can even display the closest area code to a visitor. Geo-routing does not give you any tracking benefits (since you can already see a visitor’s location on caller ID anyway), but localizing the tracking phone number can make it more likely that your customer will call it. Convirza is similar to CallTrackingMetrics. You get a lot of options for dynamic number insertion (including geo-routing), which unfortunately also makes things a bit more complicated than CallRail. Convirza discusses dynamic number insertion in more detail here. Call whisper: play a short message before incoming calls are connected that identifies the source of the caller to the person receiving the call. 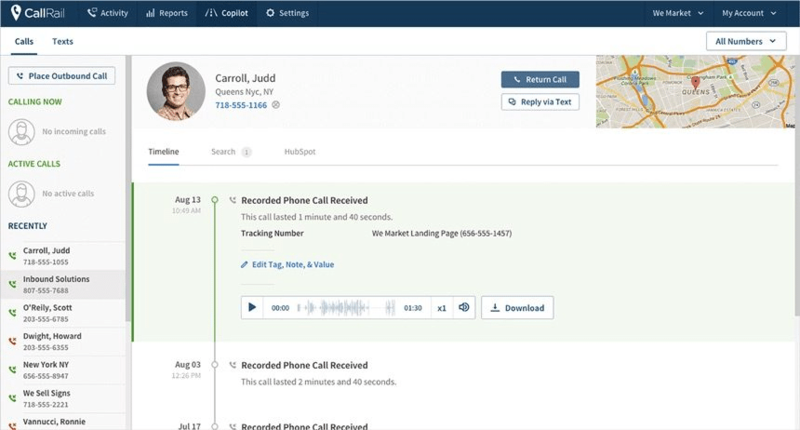 Call recording: automatically record calls and listen to them from your dashboard. You can insert a message such as “This call will be recorded for quality assurance” to comply with any call recording regulations. Caller history: view previous conversations you’ve had with a caller, including any notes you’ve saved. CallRail has a few additional call tracking features. In particular, we liked that you can create click-to-call forms to add to your website. When a visitor fills one out, you can receive an alert via text or email so you can respond to them immediately. CallRail also has a unique dashboard called “CoPilot” where you can view caller information in real-time. As a call comes in, the dashboard shows their name, location, and a history of any previous conversations. If you integrate your CRM or Gmail account, you can even pull up CRM records and email history, respectively. From the “CoPilot” dashboard, you can also send and receive SMS text messages using your CallRail phone numbers. Another unique feature is CallRail’s special package for medical businesses that is compliant with HIPAA and HITECH regulations. It has separate pricing, which will vary depending on your call volume. CallTrackingMetrics also has click-to-call forms and SMS messaging. Their texting is a bit more advanced, as you can actually track texting the same way that you track calls. You can also setup auto-responses via text. This means that you can use CallTrackingMetrics as a basic SMS marketing system as well as a call tracking solution. The other powerful feature of CallTrackingMetrics is their speech analysis. The system automatically transcribes calls and identifies keywords, such as “wrong number,” “appointment”, or “upset.” Based on these keywords, you can trigger a number of actions. For example, remove wrong numbers from your reports, apply a special tag to customers who schedule an appointment, or alert a manager when a customer appears upset. Like CallRail, CallTrackingMetrics can also be setup to be HIPAA compliant, but it takes a little more manual work. Convirza’s additional features revolve around call analysis. It’s similar to CallTrackingMetrics, but more advanced. Convirza’s algorithms look for phrases and speech patterns to score how likely a lead is to buy and how well your salesperson performed. Using the results of the test, you can trigger emails or other actions. For example, you might want to notify a sales manager when a hot lead fails to convert. You can also trigger updates in your CRM. For example, if a customer schedules an appointment the opportunity stage can be automatically updated. CallRail: CallRail offers an online knowledge base, including documentation and API, and ticket-based support. CallTrackingMetrics: CallTrackingMetrics offers the most comprehensive online knowledge base, including a getting started guide, webinars, and a “university” of tutorials. They also offer phone, email, and ticket-based support from Monday to Thursday 7:30am to 7:30pm EST and Friday 7:30am to 5:30pm EST. Convirza: Convirza’s online support options are relatively minimal. 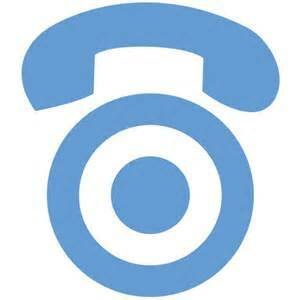 Phone and email-based support is available from Monday to Friday 7:00am to 5:00pm MST. CallRail is the only program we found that offers sophisticated call tracking without the additional that drive up the price unnecessarily. Creating a number pool and adding a single line of code to your website will let you track what website each of your phone leads are coming from. Wow. So much information about analytics. But I think phone calls are losing their purpose, Texts and emails are more liable for lead generation. Too many annoying robocalls now. Thanks for the heads up. We’ll explore this and any other new features during our next update.